Maximum Security contains 13 modules to use in whatever combination you like to enhance your games. There are new security measures to give you more trouble (guards, Beholder, motion detectors, and armoured doors), but there are also new abilities to make the heroes' task a bit easier (climbing through ventilation shafts, breaking through walls, casting spells, and even rearranging the mall). You want more? How about 42 achievements? Can you complete them all? 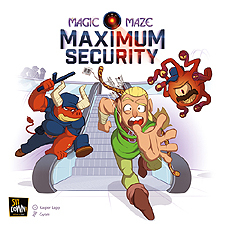 Note: Maximum Security is an expansion for Magic Maze. This box is not a complete game, you need the base game to play.